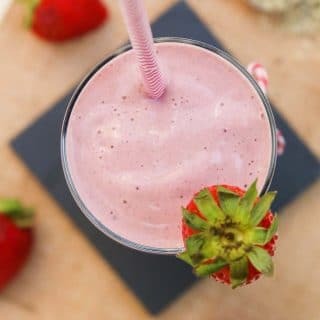 This thick and creamy vegan 5-ingredient Strawberry Milkshake Recipe is full of protein and makes for the perfect breakfast, snack, or dessert on Valentine's Day! Allow the frozen strawberries and frozen banana to thaw at room temperature for about 5 minutes. Place all the ingredients in a powerful blender (I used my Vitamix). Use between 3/4 cup to 1 cup of the non-dairy milk depending on how thick you want your milkshake to be (I used 1 cup). Completely blend all the ingredients. Use a temper to push down the contents of the blender to help the blending process. The resulting milkshake should be thick and creamy. Pour the strawberry hemp milkshake into 3 or 4 glasses, garnish each glass with a strawberry, and enjoy! I typically wash and freeze fresh strawberries and bananas for this recipe. If you don't have frozen fruit, just add a few ice cubes. It won't be as thick, but still just as delicious!